The Rangers won 18 post-season games over the last two years but did not win the World Series in either year. In fact, they won more post-season games than 11 of the World Series winners since 1995 (using both the year before and after). 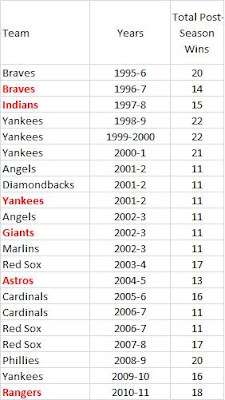 The Rangers' 18 wins is the 6th highest two year total and all the teams with more did win the series in at least one of the years. Here are the leaders for each two year period and the teams that failed to win the series in either year are in red. There were some ties so all of those teams are listed. I think I counted and entered everything right. Let me know if you spot any mistakes. Does Yahoo Sports Have Mistakes In Its Baseball Data? It seem like SLGA is supposed to be slugging percentage allowed. Yahoo may have divided TB by TBF instead of AB. Buehrle has allowed 4011 TB in his career and 4011/10317 = .389. But if they used that for SLGA, what is OBSA? I thought it might be OPS allowed, but then Buehrle should have .704 using Yahoo's numbers. But they show only .689. So it is not clear what is going on. 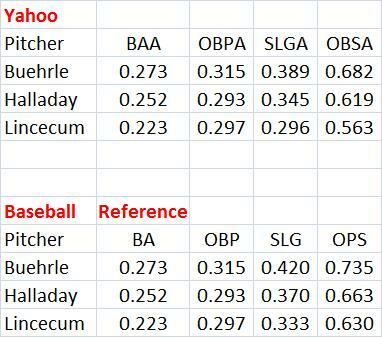 Here are the links the Yahoo pages for these three pitchers. The Pirates were lucky to win the 1971 World Series, but how lucky? This came up on one of the SABR bulletin boards. Did The 2002 A's Of "Moneyball" Fame Win More Games Than Their Stats Might Predict? The A's had an OPS of .771 while their pitchers allowed an OPS of .699. So their differential was .072. The equation predicts a pct of .591 or about 95.7 wins. They actually won 103. So they won about 7.3 more games than expected. The standard error of the regression that generated the above equation was 5.04, so the A's were 1.44 standard deviations above their expectation. Not huge, but not small either. They did have a 32-14 record in 1-run games for a pct. of .696. They had a .612 pct. in all other games. If they had that for all games, they would have won 99.16 games, alot closer to what their OPS differential predicts. I don't see anything in particular that explains why they outperformed their projection. 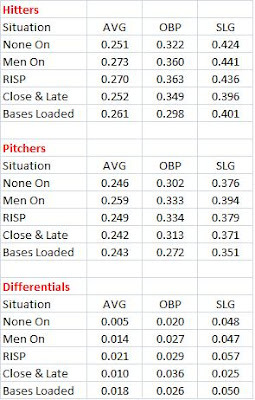 The table below shows how both their hitters and pitchers performed in various situations followed by their differentials in those situations (data from Retrosheet). Nothing really jumps out. Their differentials with runners in scoring position (RISP) are a bit higher than with none on and to a lesser extent with bases loaded. 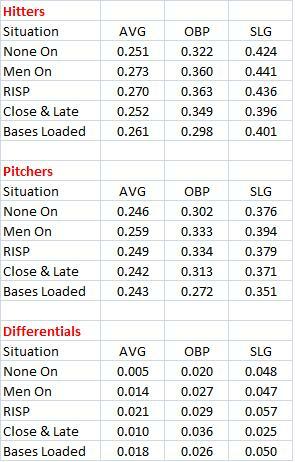 Their OBP differential looks good in close and late situations but their SLG differential is much lower than normal. Their overall OBP differential was .024 while for SLG it was .048. The A's grounded into 128 DPs, just one more than their opponents, whom they out OBPed .339 to .315. Their GIDP rate was 10% while the league average was 11%, the rate the A's allowed (some data also from Baseball Reference). The A's only had 20 sacrifice hits while their opponents had 50. So they saved 30 outs that way. The A's were46-20 stealing while their opponents were 68-46. So they saved 26 outs there. All of that is about two games worth of outs. The A's out homered their opponents 205-135, by 70. They only hit 10 more 2B's than their opponents and had the same number of 3B's. So their advantage in SLG was almost entirely determined by this big HR advantage and HRs have one additional edge over other hits in that they guarantee at least one run. Has Starlin Castro done things offensively that guys who go on to be ten-time All-Stars and Hall of Famers did? "Offensively, the things he has done is what guys who go on to be ten-time All-Stars and Hall of Famers do." See Theo Epstein Loves Starlin Castro and Other Bullets at "Bleacher Nation." The list below shows all 2B-SS who had 500+ PAs through the age of 21 and their OPS+. He is close to two Hall of Famers, Alomar and Ripken. He has done better so far than two frequent All-Stars, Whitaker and Randolph. 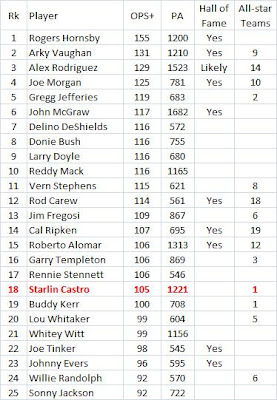 But Delino DeShields and Gregg Jeffries did better and are not in the Hall and Jeffries had just two All-Star teams.